Perhaps the first sport in North America, "baggataway” was played by Native Americans as far back as the 1400's, often with thousands of people participating and goals spread miles apart. French colonists referred to the stick used to play as a “crosse” — French for a “bishop’s staff” — and lacrosse was created. A Canadian dentist, W. George Beers, established the rules in 1867 that formed modern lacrosse. Traditionally an East Coast sport, lacrosse has experienced recent growth at the high school and college levels, and the game has expanded across the country. 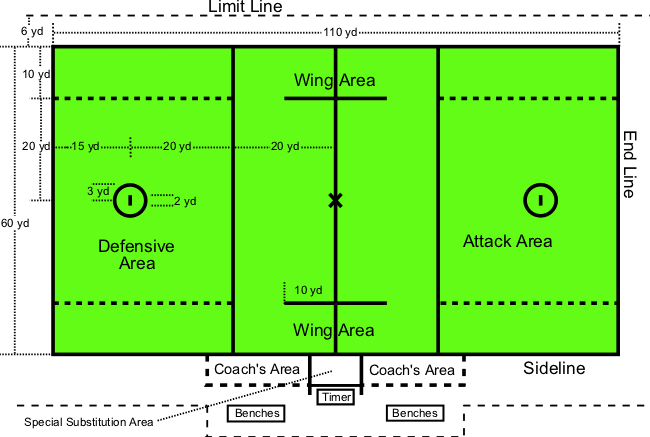 Attack area/defense clearing area: The offense has 30 seconds to move into this area after gaining possession in their defensive half. Also, attackers and defenders must remain in these areas during the face-off.